Call Down Thunder by Daniel Finn sounded intriguing. Two siblings living in a small coastal village; Mi who hears voices and her brother Reve who wants to protect her from the dangers of the world. When Reve has a vision of a mysterious woman waving at him, Mi is certain it is their mother; the mother who abandoned them many years earlier after their father died. Mi is determined to find her even if it means risking the dangers of the city. The main reason why I was disappointed in Call Down Thunder was because not much happened in it. It took more than a hundred pages before the story got to the point that I wanted; Reve and Mi in the city searching for their mother. The story did improve at that point, but the action was over too quickly. I liked the introduction of Demi and Baz from Finn’s other book, Two Good Thieves. There was a huge build up about Reve and Mi’s mother, but she was also disappointing. From the amount of secondary characters mentioning her and Mi’s determination to find her, I thought she would be a many-layered, main character. She wasn’t a bad character; she simply didn’t explain any of her motives to Reve and Mi. Everything they learnt about her was through other characters such as Thomas and Moro. The story focussed much more on village disputes and Reve observing and commenting on the actions of the three main ‘leaders’ of the village. While Reve was a likeable main character, I didn’t know what to make of Mi. She grated on me at first because I felt like she made some wrong decisions, but I warmed up to her eventually. I would have liked to have known more about the visions and voices she heard. 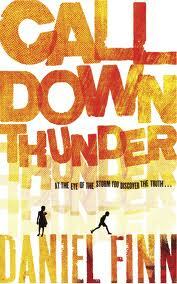 In all, Call Down Thunder was an okay read but it wasn’t what I expected. It's always a shame when a book takes forever to get going and the characters don't really carry it :( Sorry you weren't that keen, Clover! What a shame that this book didn't work out so well for you, but thanks for explaining your reasons for your disappointment so well! Oh, it does annoy me when books take forever to get going and nothing much happens even then :( Sorry this didn't work out for you and thanks for the honest review. I'm sorry you weren't able to enjoy this as much as you hoped Kulsuma. I really like my books to keep me hooked from the beginning, so well done for sticking this book out despite the slow start. I hope your next read is a lot more enjoyable!